'The Noust' Community Boathouse was the first public building that we designed and built through Tog Studio, our 'live-build' construction school. Click here to see films of this project under construction. Conceived as a two phase development; the building was constructed during two week-long events in the summers of 2013 and 2014. 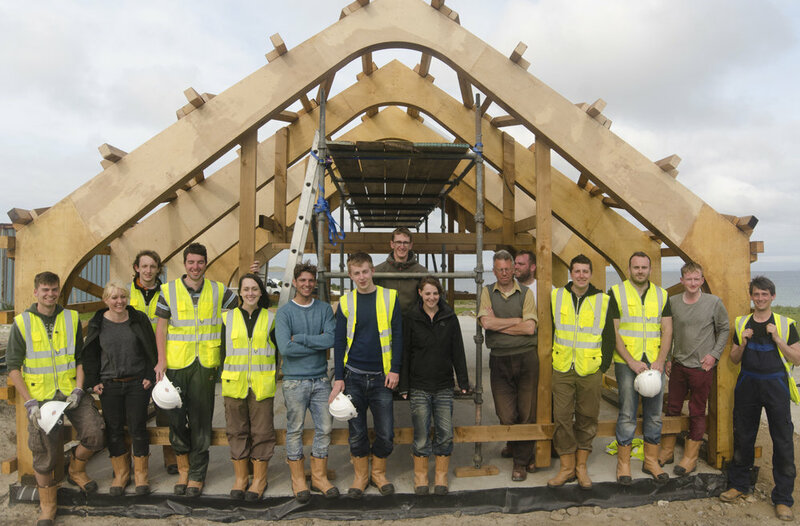 During these events we welcomed around 50 participants to the Isle of Tiree from across the UK and as far afield as New York to help us with the construction process. The participants varied from students of architecture and engineering, to professional architects, and individuals who were purely interested in the experience of making something exciting with an interesting group of people. 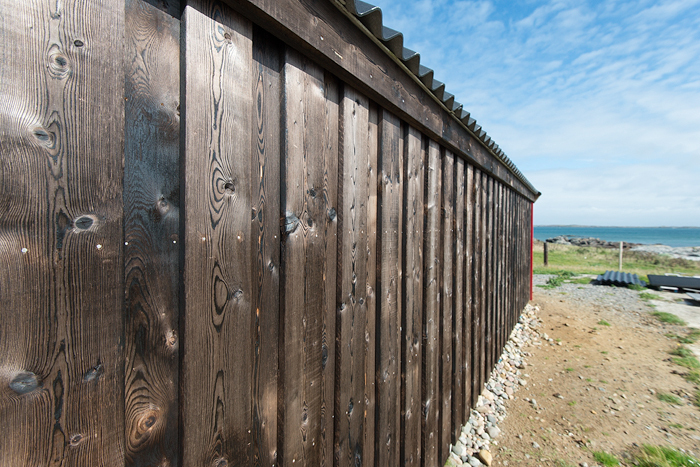 The building was designed for Tiree Maritime Trust (TMT), a local charity who desperately needed a dedicated workspace for storing and maintaining their fleet of traditional sailing boats. The boats are clinker-built dipping lugs, which are unique to the island and designed specifically for fishing off the coast. The TMT had an ambition to preserve this part of the island's cultural history by getting new generations of the community involved in the sailing and restoration of the boats. To do this they required a suitably inspiring space to use for this purpose before the boats became rotten through exposure to the elements. 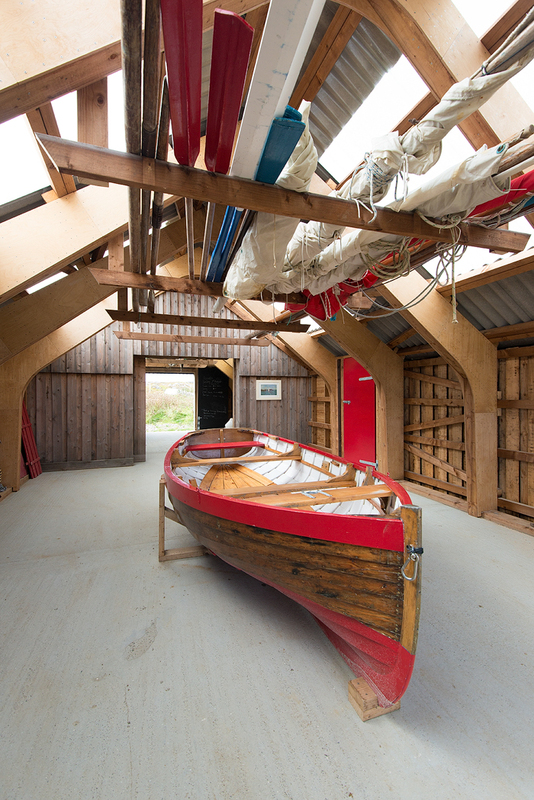 The partnership with Tog Studio enabled Tiree Maritime Trust realise our goal of building a boathouse. 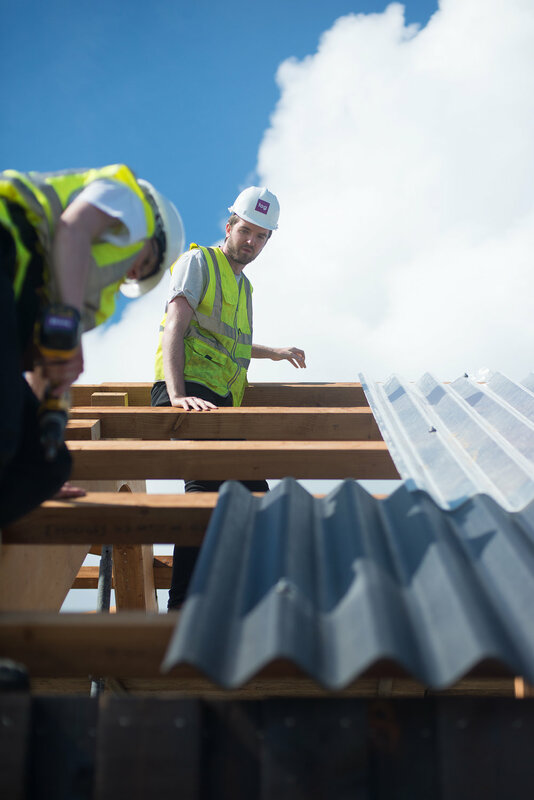 The innovative way of delivering the project by working with the local community and hosting an architecture summer school made the project possible financially. The design set out an agenda to make the construction process as accessible as possible to a team of people with no prior experience in using hand tools. We drew inspiration from traditional timber frame construction techniques and digital fabrication and the result was a series of ply-box portal frames that could be repeated and extended along the length of the building. The frames were suitably robust to withstand the considerable wind loads on this exposed site, yet sufficiently lightweight that they could be raised into position by a team of people, and avoid the need for heavy machinery on site. The frames were partially pre-fabricated on the mainland using parts cut by a CNC router, and this help to maintain the quality and accuracy of the components. The frames were the perfect marriage of under-utilised C16 Scottish timber and precision cut plywood. This combination enabled us to get the most from each material and achieve sizeable clear openings of around 6m to maximise open workspace within the building. The style of the building takes its queues from the boats themselves and the island landscape. The interior was intended to reflect the curving shapes of an upturned boat. The exterior walls were clad in vertical board on board timber and the roof was covered with corrugated cement fibre board; these are typical of utilitarian and agricultural buildings on the island. The roof was black and features a curved ridge to emulate the traditional black-top houses that are indigenous to the island. Tog Studio was a catalyst for the project by providing integrated architectural and engineering design services, industry sponsored materials, an energetic workforce of student participants and project management of the build. Through collaboration with Tiree Maritime Trust, Tog Studio took the boathouse project from idea to completed building within two years.